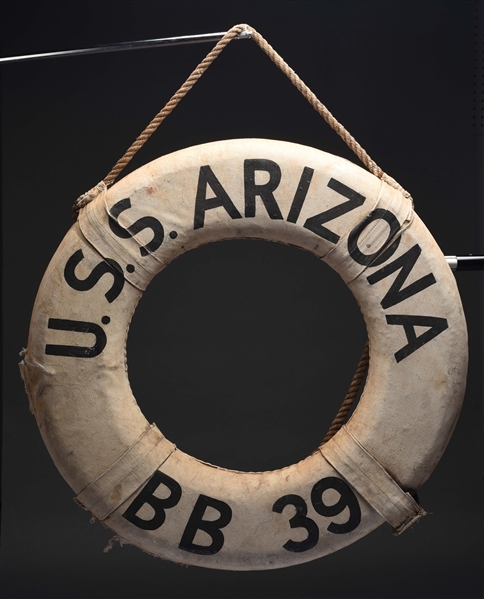 Lot Detail - USS Arizona Life Ring Recovered After Pearl Harbor Attack. USS Arizona Life Ring Recovered After Pearl Harbor Attack. 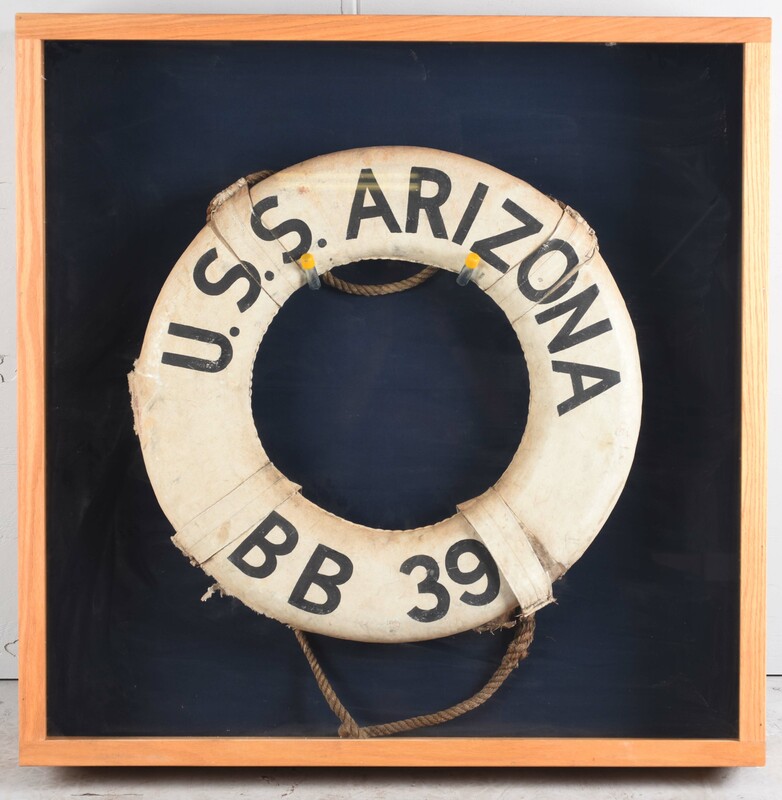 One of the most iconic military and maritime relics to come to the private market in years, this is a U.S. Navy regulation life ring from BB-39, the USS Arizona. Aside from the RMS Titanic and Noah’s Ark, this is arguably the most famous ship in world history. Her sinking was the single largest loss of life for the U.S. Navy up to that point in time, and the most servicemen deaths in one day since the American Civil War. Shortly before 08:00 local time on 7 December 1941, Japanese naval aircraft from six aircraft carriers struck the Pacific Fleet as it lay in port at Pearl Harbor, and wrought devastation on the warships and installations defending Hawaii. On board the Arizona, the ship's air raid alarm went off at 07:55, and the ship went to general quarters immediately. Shortly after 08:00, 10 Nakajima B5N "Kate” torpedo bombers, five each from the carriers Kaga and Hiryu attacked Arizona. All of the aircraft were carrying 16", armor-piercing shells modified into 1,757lb. bombs. Flying at an estimated altitude of 9,800 ft., Kaga's aircraft bombed Arizona from amidships to stern. Soon after, Hiryu's bombers hit the bow area. The aircraft scored four hits and three near misses on and around Arizona. The near miss off the port bow is thought to have caused observers to believe that the ship had been torpedoed, although no torpedo damage has been found. The sternmost bomb ricocheted off the face of Turret IV and penetrated the deck to detonate in the captain's pantry, causing a small fire. The next forward most hit was near the port edge of the ship, abreast the mainmast, probably detonating in the area of the anti-torpedo bulkhead. The next bomb struck near the port rear 5-inch AA gun.The last bomb hit at 08:06 in the vicinity of Turret II, likely penetrating the armored deck near the ammunition magazines located in the forward section of the ship. While not enough of the ship is intact to judge the exact location, its effects are indisputable: about seven seconds after the hit, the forward magazines detonated in a cataclysmic explosion, mostly venting through the sides of the ship and destroying much of the interior structure of the forward part of the ship. This caused the forward turrets and conning tower to collapse downward some 25–30 feet, and the foremast and funnel to collapse forward, effectively tearing the ship in half. The explosion touched off fierce fires that burned for two days. The bombs and subsequent explosion killed 1,177 of the 1,512 crewmen on board at the time, approximately half of the lives lost during the attack overall. The remains of the ship are now a national shrine and part of the WWII Valor in the Pacific National Monument. No artifacts or relics are allowed to be taken off the ship, and anything that exists on the private market came off of the ship prior to, on the day of the attack, or shortly thereafter. Even the smallest relics are highly sought after, and to be able to purchase such a stunning visual relic such as this one is a rare opportunity indeed. This ring is stenciled in a 1940 regulation style with the ship’s name “USS ARIZONA”, and it’s naval designation of “BB-39” or Battleship-39. This was likely a newly acquired buoy from the final overhaul and retrofit that the Arizona underwent in the Puget Sound Navy Yard, Bremerton, Washington, from October 1940 to January 1941. There are only a few other rings in historical institutions from the Arizona, and the only life ring at the Pearl Harbor museum was from one of Arizona’s 50 foot motor launches that was at the boat boom and not damaged during the attack. There is no doubt that nearly all of these rings never had the chance to be used and went down with the ship or were burned. This ring is canvas covered cork and is 100% original in every manner. Under magnification, the whitewashed finish shows appropriate patina and age as does the black painted lettering. It is not a re-paint of another ship’s ring, it has always been lettered for the USS Arizona only. The ring retains it’s original nautical hemp rope hangers, and the reinforcing bands are also original and correct. The ring shows multiple areas that are consistent with being stained by fuel oil that was leaking out of the bunkers on the ships that were hit by aerial torpedoes on Battleship Row. These stains only add to the aesthetically moving and very emotional history attached to this relic. 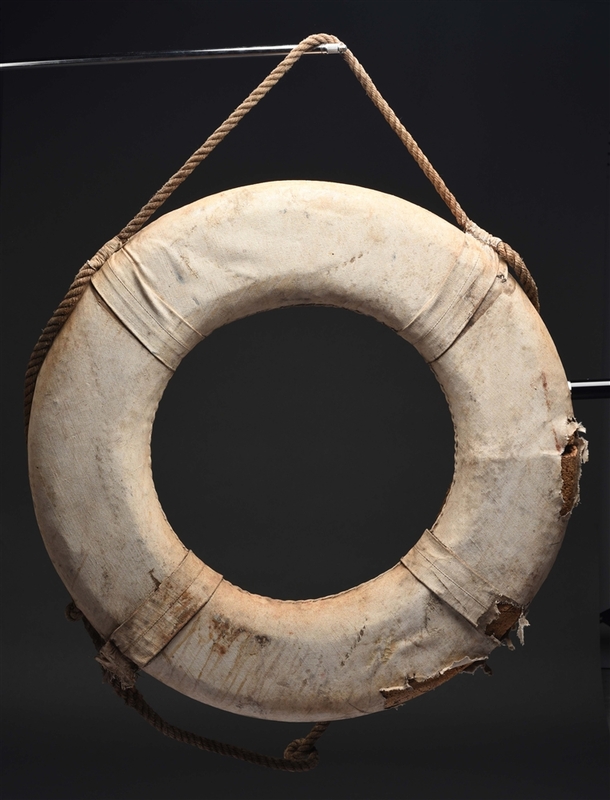 Thousands of photos of the USS Arizona in numerous archival holdings were examined by our experts while researching this life ring. Numerous stencil patterns were noted from 1917-1941. This is not one of the earlier styles, and corresponds to photos of rings from sister battleships taken in 1940-1941. The ring was the former property of Chief Petty Officer Allan Randle Moyers, who obtained it from a sailor who was part of the rescue operation on Dec 7th. Moyers himself was not present during the attack, but received the ring as a gift at a later date. Oral history that Moyer passed to his son was that the ring was used as a flotation device for a sailor that was rescued while clinging to it the morning of the attack. Included in the auction is a notarized letter of the story as passed from the Moyers family to the consignor. A former curator at the USS Arizona memorial examined the photos of the ring and confirmed the style, size, and stenciling as one of the larger size rings that would have been on the battleship herself and not one of the motor launches. He had no doubts as to the authenticity of the ring and desired it for donation or purchase, but at that time the ring was not available. A current historian at the Valor in the Pacific Museum has examined the images and also concurs with the previous curator's assessment. CONDITION: Very Good with original period paint. All pieces present with strong lettering and good paint adhesion overall. One bottom canvas reinforcing band is coming loose but still halfway attached. This is not a standard shippable item and will require 3rd party shipping or pickup arrangements to be made.